When I was adjusting the menu for the party I had at the end of September, I was trying to find quick appetizer-style recipes that would work well with the other things we were serving. I hopped onto my Pinterest account to see if I had anything worthwhile saved and I found these Homemade Pizza Rolls. I figured pizza rolls are something that everyone likes so I should definitely add them to the menu. It was a great decision because these were scarfed up pretty quickly. 1. Heat the olive oil in a small skillet over medium-heat. Add the onion, green pepper and garlic and cook for 3-5 minutes or until softened. 2. Meanwhile, preheat the oven to 375. Spray two baking sheets with non-stick cooking spray. 3. In a medium bowl, combine the marinara sauce and shredded cheese. Stir in the onion mixture. 4. 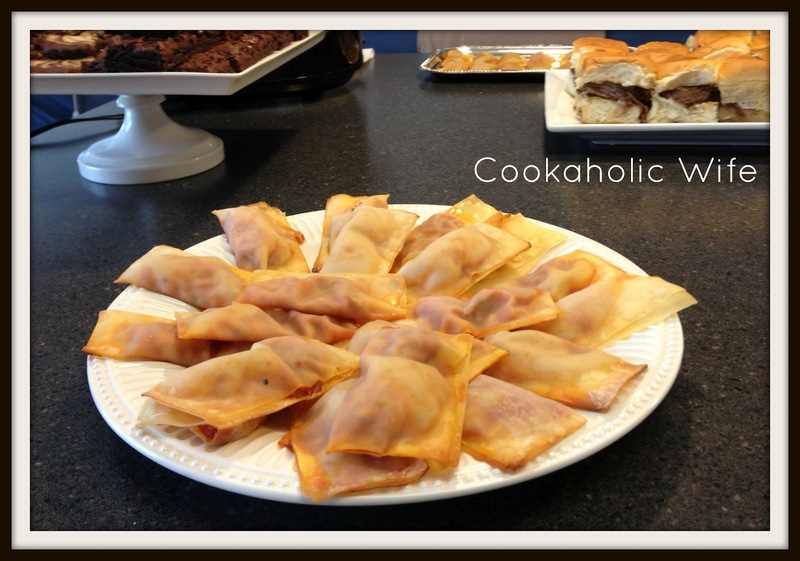 Lay out wonton wrappers on the prepared baking sheets. Add a spoonful of the mixture to the center of each wrapper. 5. Use your finger to wet the outside of the wrappers and fold them over. 6. Repeat with remaining wrappers. Spray the tops with non-stick cooking spray. 7. Bake for 12-15 minutes or until lightly golden. Serve hot. I think I could have cooked mine a little bit longer, I went with 12 minutes just because the guests had started to arrive and I didn’t want to forget about them in the oven. I was pleasantly surprised at how similar they tasted to the packaged pizza rolls you can buy from the store. But no preservatives! Yay! I would never have thought of wonton wrappers for pizza rolls. Perfect, so much easier than dealing with dough. Thanks for the great idea.